One of the questions I am asked frequently about commuting by bicycle is if I sweat and change clothes once I get to work. It's a great question and I can understand the concern--especially for women. And my answer is "not really, the extent of my perspiration is usually not any more than if I went on a brisk walk in the middle of the day" and "no, I wear the same clothes to ride my bicycle as I walk around in the office with". They are surprised to hear that, especially after knowing that I ride 10-miles one way. 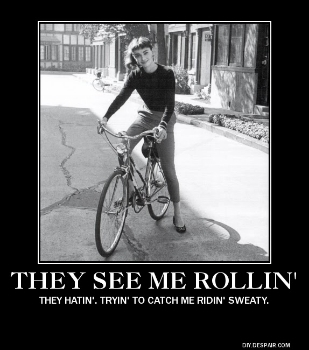 Audrey Hepburn staying sweat-free on her bicycle. I bike in regular clothing because I like not having to change once I get to the office and having to change back for the trip home. The funny thing is...my colleagues would have thought I drove my car in if I weren't pushing my bike into the office. Dressing too warmly is one of the biggest contributing factors to sweating. Even during the winter I try not to wear heavier clothing than I need to. The idea is to dress in layers (for example, a tank top or camisole underneath a long-sleeve t-shirt with or without a button up shirt and a cardigan or light jacket). It is a little chilly when I head out the door but after a few minutes of pedaling, I generate enough body heat to stay warm. I peel off my layers of clothing before I feel my body temperature rising above being uncomfortable and stow them in bag that hang off the rear rack of my bike until I get to the office. Add layers to stay warm at the start of your ride and stow away clothing as you start to warm up BEFORE you start sweating. Add tights, boots and a scarf for additional layers. Just because it's winter doesn't mean my dresses stay in storage. Skirts and dresses make excellent layering pieces! When you are riding to work in the morning, pedal at an easy pace and save the workout ride for the way home. I often have to remind myself to slow down when I'm having too much fun going fast in order to avoid breaking a sweat. Road cycling has taught me to ride a smaller gear and pedal faster (there are times when you need to do this but it tends to bring my heart rate up). Now when the road is flat, I shift into a bigger gear and pedal slower yet I can still maintain the same speed. It helps to keep my heart rate down. Stop lights are a great opportunity to rest and lower the heart rate to keep perspiration at bay. But you're still getting more cardio and physical activity than driving!! Not only will you feel the weight on your back and shoulders if you carry your things in a backpack but doing so could make your back sweat. It is okay if you're going to change clothes once you get to work but the goal is NOT to sweat so that you do not need to change clothes when you get to your destination. If you have a lot of hills along your route, it will be hard not to get sweaty no matter how slow you go. A bicycle with a battery powered electric-motor can help ease the effort to get up those hills to keep sweating to a minimum. Less physical exertion can result in less sweat. If you do not have an electric bike, your best bet is to use a small gear and spin to ease the effort of going uphill--and take your time!! Relax, sit back and spin up the hill. It is not a race. Some clothing pieces have better moisture-wicking fabric to draw the sweat and moisture away from your body than others. This helps you to stay drier and smell less. Look for performance innerwear such as bras, camis, tank tops, tees and long sleeve t-shirts to wear underneath your regular clothing. If you have a long ways to go you could bike and bus or the other way around to cut the distance you have to travel. And if you are really concerned about arriving at work in a hot mess, you could bring your bike with you by bus or carpool and ride home in the evening. Carry (or keep at the office) wet wipes and/or a small towel to dampen and wipe off should you get sweatier than planned. Sometimes during the height of summer I will carry my blouse or button up shirt in my pannier bag and an extra base layer (camisole or tank top). Then after I arrive at the office, I will change out of the sweaty inner layer and slip on a fresh one underneath my blouse or button up top. I also keep a set of clothing in my desk drawer (camisole, button-up shirt, pencil skirt, and socks) but I have never needed them. What you wear, how hard you ride and how you carry your things will make a difference in how much you sweat. After a few rides you will get better and better at knowing what works for you and what doesn't. I like to pedal at an easy pace to enjoy the fresh air and the outdoors. 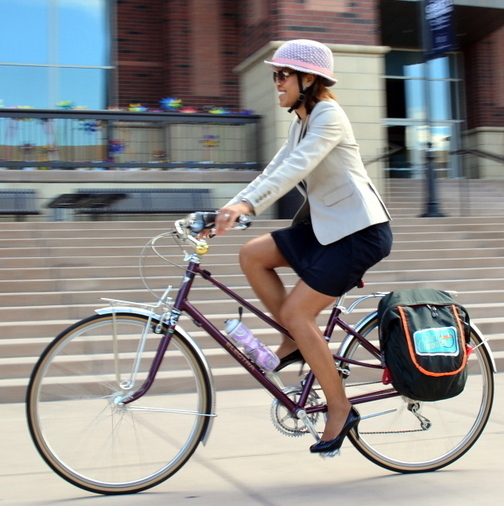 I wear my office attire when I commute by bicycle and I let my bike do the work in carrying my things so that sweating is one of the last things on my mind.